We've had some great golf these past few weeks. The Member Guest Invitational was very memorable. We had absolutely perfect weather. The flop wall competition and skills challenge was fun as always. The Travis Mathews bus was here providing a great shopping opportunity and a really cool hang out spot. Jamie of course went completely over the top with the food. I honestly don't think anyone can come close to matching his ability. And then there was the emotional award ceremony when we said goodbye to Rich Friend. Rich has been the Golf Professional for the past 27 years and my friend for the past 23. Tears were shed by everyone as we mourned his departure and celebrated his amazing service to the Club. I will never forget that affectionate sendoff and I wish Rich the best on his new adventure. 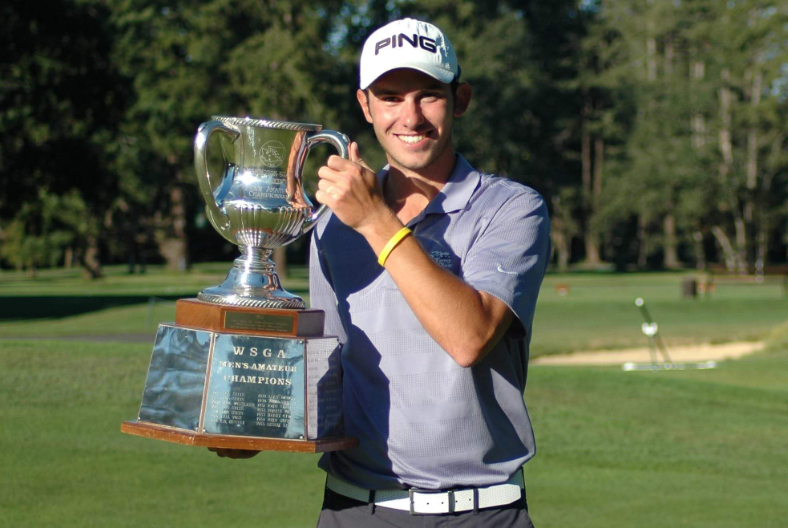 Then this week the Club hosted the 90th Washington State Men's Amateur. On the 60th hole following a 6 hole playoff our very own Chase Carlson secured the win. It was a fantastic event and the first men's championship held at the Club since the 1998 Washington Open. Before the new teeing grounds were built during the recent award winning renovation of the golf course, Tacoma simply didn't have the length to challenge today's long hitters. Now the course has teeth again and the expansive teeing grounds also provided some interesting options for the tournament coordinators. Check out this picture of the setup on the final day of the Men's Amateur. The 7th hole was played from the 17th tee at over 420 yards. That's 31 yards longer than the rated black tee for number 7. To see more pictures of the event click HERE and check out the WSGA facebook page. Click HERE to go to the WSGA website and see all the details of the event. The golf has been amazing these past few weeks but unfortunately the golf course has not. Sure it may look good and the greens have been very fast but with each season our frustration increases because so does the shade. Above is a picture of #4 green and notice that the back of the green is in total shade. Notice also that the shadows are very short as the sun is virtually straight up above when this picture was taken. The back half of this green receives virtually little to no direct sunlight and this makes maintaining tournament quality firmness impossible. We monitor moisture in the greens with this device. In the picture below notice the reading shows 25.7% water content. That's a little high but at the time we took this reading we were setting up for a 90 degree day. We prefer to keep the moisture at about 18-20% for good firmness and that's adequate moisture to get through a normal day of 75-80 degrees. Now check out the reading of the moisture content of the back half of the green which is always in the shade. Yes that says 40%. Keep in mind that these readings are being taken after we already have taken steps to dry down the back half of the green. For example, the sprinklers on the back half of #4 have been changed to part circles which means they aren't even spraying water on the back half of the green. We do this by changing out the internal motors of the sprinklers. This of course takes time and constant monitoring. Even still that half of the green will just not dry down due to all the shade. The fourth green is not our only problem area. Look at these aerial images. The first picture is of #4, the second is of #3 and the third picture is of #11. Excessive shade is a constant problem and one that is only getting worse as the fir trees at Tacoma are not done growing. The shade is increasing with each season and so are the expectations for good, consistent putting surfaces. On the bright side, check out this picture of #2 green taken mid day with the sun straight up. The putting surface now receives adequate sunlight since we removed those three fir trees behind the green last winter. We used to have the same problem with excessive moisture on #2 but not any more. Of course moisture is not just about firmness and how the ball bounces on a green. It's also about smoothness. When the surface has too much moisture, foot traffic can make for terrible smoothness by days end. If your as worried about this shade problem as I am, then worry no more. The Club's Tree Management Plan addresses the need for sun on greens 3, 4, and 11 and there will be some thinning of the trees this upcoming off season. There is also plans to improve the quantity of sunlight for the 18th green but this involves morning light which is the best light. Check out this picture of #18 at noon on a sunny August day. Because of the trees northeast and east of this green, the back right corner never receives any morning light. It receives adequate afternoon light to maintain turf coverage but Tacoma has higher standards than just turf coverage. In order for this green to have good putting quality and consistency, some morning light is essential. Only two trees will be removed to correct this problem. I know tree removal is an emotional issue for some people but rest assured the Club is using the best professional council regarding these agronomic challenges and making Tacoma the best it can be is the Committee's prime directive.